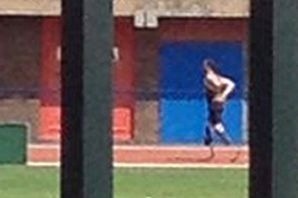 Olympic runner Oscar Pistorious was spotted on the track of the University of Pretoria and may be considering Training for the Olympics soon. The Paraolympic runner was photographed with his running blades on for the first time since he admitted shooting his model girlfriend Reeva Steenkamp at his South African home on Valentines Day. Training could be a grieving outlet for the runner, although his uncle Arnold Pistorius added: “Oscar is not back on any official training programme. It is the first time Pistorious has put on his blades since Steenkamps death. Oscar Pistorious’ bail has still not been determined. But the Paraolympic runner revealed more details. He says that it was dark inside his apartment when the shots were fired. Yet, a neighbor says that she heard arguing earlier in the evening; and later heard shots, saw a light come on, heard a woman screaming and then heard more shots! An illustration of the athletes apartment was shown with images of what he says happened. He says on Valentines night, he got out of bed to bring in a fan that was on the patio. He then heard noises, and scooted to where his gun was. He says he did not have on his prosthetic legs. He then scooted in front of the bathroom door, and started to shoot. But investigators say that how the gunshots are positioned in the door ( pointing down,) there’s no way Pistorious was on the floor. The shots would be pointing up if he was in fact shooting from the floor. In fact, the shots point directly at the toilet!